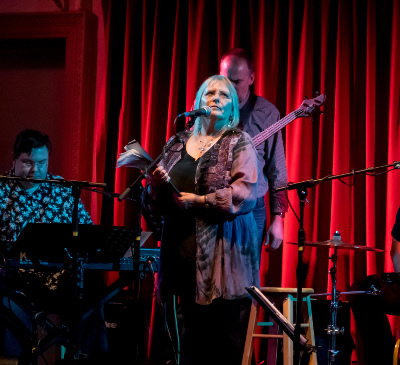 Judy Dyble comes to The Lantern Theatre with her Band of Perfect Strangers, promising an enchanting evening of folk and jazz with perhaps something of an other-worldly psychedelic tinge to the whole affair. Judy Dyble had been part of the various pre-Fairport incarnations of jug bands and folk trios and other delights and was the original singer, autoharpist and recorder player for the band once they decided to be called Fairport Convention. She joined them in their many and varied falling-apart vans at their many and varied gigs in London, the UK and their first gigs in Europe. Appearing on their first single, ‘If I had a Ribbon Bow’ and after the release of their eclectic first album, Judy left to join with fellow London based musician, and later founder member of Foreigner, Ian McDonald which resulted in a collaboration with the musicians who later collectively became King Crimson – Robert Fripp, Peter and Mike Giles. After recording a few songs with them which later surfaced as ‘The Brondesbury Tapes’, she became one half of the stunning, if short lived duo Trader Horne, whose eponymous (and only) LP &apos;Morning Way&apos; is still considered to be a classic of its day. The duo Trader Horne reunited in Nov 2015 with a brilliantly received one off performance of ‘Morning Way’ at Bush Hall in London and one final appearance at the ‘Green Man Festival’ in 2016. After a short, but jolly collaboration with Lol Coxhill and Canterbury musicians Steve and Phil Miller as DC & the MBs, Judy promptly retired to raise a family, until 30 years later she returned to music to create new music in a way that hadn’t even been dreamed of in 1970. The internet had arrived in the intervening years and with it the ability to record remotely and seamlessly weave contributions from everywhere into a beautiful tapestry of songs. Three albums released with Marc Swordfish of Astralasia between 2004 and 2006 marked her return to music. ‘Talking With Strangers’ followed in 2009, ‘Flow and Change’ in 2013, and ‘Live at WMJazz’ in 2014 and ‘Gathering The Threads’ - her Anthology of odd music from 50 years - in 2015. She has since finished writing her autobiography, ‘An Accidental Musician’ published in May 2016, and has released a critically acclaimed album, ‘Summer Dancing’ with Musician/DJ /Producer Andy Lewis.